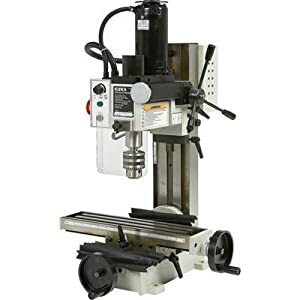 For a DIY enthusiast or someone who is in the business of woodworking or metal crafts, a milling machine is a great investment. 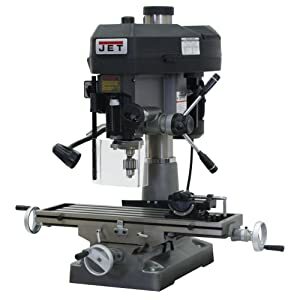 However, buying huge milling machines comes really costly. Hence, a mini milling machine is the best option. What’s the great thing about mini-mills? It’s a total space saver which means you can have it at the comfort of your home. Likewise, it has great power to help things get done whether you’re working on wood, aluminum, plastic, or metal sheets. Mini-mills are much affordable compared to its full-size counterpart. If you don’t have a solid idea on choosing the best mini mill. Don’t panic as we have a comprehensive guide in here that will help you choose the right mini mill. We have also compiled the top 10 best mini-mills for you to get your eyes on as there are hundreds of units out there. Here are some of the important features and factors you need to look for in a great mini mill. They might be called “mini-mills” but they actually are heavy. Most of these tools have weights ranging from 300 to 700 lbs. Before buying, make sure you already have a place at home to put this powerful tool. A regular workbench might be good for its placement but make sure it's still durable and the legs won't wobble once the machine works. The heavy weight of the machine adds stability to the workbench. All you need to do is secure the legs of the workbench so it won’t break. Despite the heavy weight of the unit, this feature can help minimize vibration during operation. The heavy weight of the power tool adds stability and balance which reduces the effect of vibration. This refers to the vertical clearance from the table to the spindle. The maximum height of the workpiece you can work on depends on the spindle clearance. This is where you will let your workpiece rest as it is being drilled or sand by the power tool. A wider table gives you more work versatility due to a wider surface area. Bigger tables allow you to work on the larger workpiece. 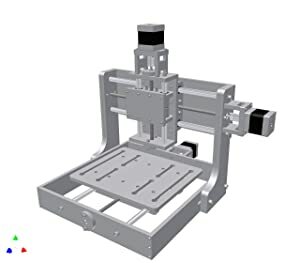 A mini-mill which can move in x, y, and z-direction will give you more flexibility. If the tool allows movement in greater distances, then you can do more work on the workpiece. There are so many things to like from this tool. The best thing about this tool is its accuracy which important for any work. It also does a great job when working with aluminum pieces. The build and heavy weight of the unit really reduce the vibration. Eventually, raising the head of the mill is slightly tedious but works perfectly fine. The machine has a durable and tough built. I love the table for it’s pretty wide and you’ll be able to work on larger workpieces. The rpm is good and adjusting it comes smoothly. I also love the safety shut off switch and the forward/reverse switch for it adds more work options. There is a slight difficulty in moving the head from left to right but it is manageable when you put some lubrication. 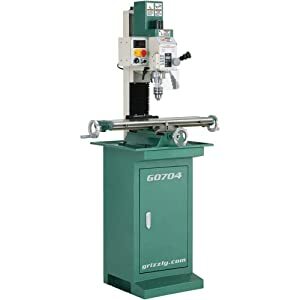 I love this machine for it's pretty easy to understand and use which is very important for beginners with milling and drilling machines. It has a well-balanced body and its heavyweight adds more balance and reduces vibration. This is a perfect tool for all hobbyist out there. You just need to buy a clamping kit to hold your workpiece on the table. I love its compact built and the smooth outer finish of the machine. It is compatible with CNC motor in case you want some upgrade. The head swivel goes smoothly 360 degrees. 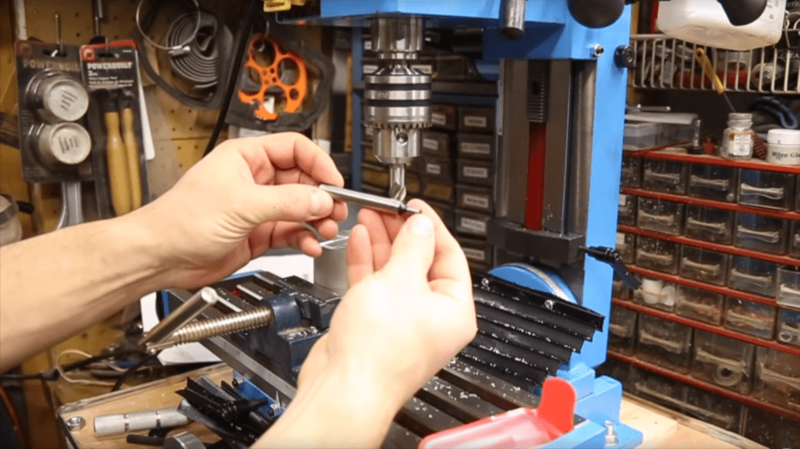 Speed adjustment for the spindle is easy and accurate. You would also love how the milling head and column can move 45 degrees left to right. Unfortunately, no stand included in the package. The great thing about this tool is it’s a combination of a Dremel function with a precision of a mill. There are constant rpm speed and enough power delivered by its 1/8 hp motor. This is a beautiful tool when you’re doing jewelry, prototypes, and small projects. There are slight deflections of the table when it is adjusted in the x-axis. For a mini mill, it has several features to like. The head tilting of 45 degrees from left to right gives more work options. Likewise, you have a low and high setting for the rpm which you can adjust based on your work. 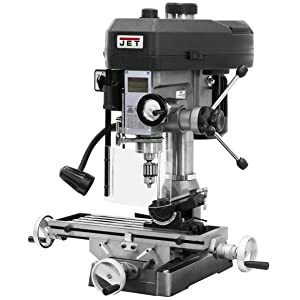 Beautiful solid power tool for a reasonable price. There is a slight difficulty when moving the table from x and y-axis. Lubrication is needed. Overall, this machine has beautiful specs and tough material. It is heavy which is good for it adds more balance and reduces vibration. Speed adjustments and the head swivel gives more work versatility. Great investment for a mini mill and drill tool. Else, the adjustment on rpm is slightly difficult to do. 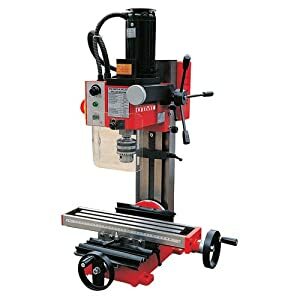 The drill chuck is very stable and no wobbling during operation. For a mini mill, it gives reliable precision and can do some light milling on plastic and soft metal workpiece. The overall design and built is really good and works fine. Speed adjustment has no problem at all. Some models have defective motors but can be replaced by calling customer service. Though it's small, it comes really sturdy and the software along with it is really good. If you're not a fan of noise, better place rubber feet under the extrusion. 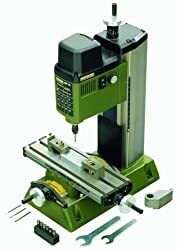 I find this tool really useful as you can use it for drilling small holes, engraving on light materials and milling as well. So far, the accuracy of the holes is really good. Though, the size of the plug seems to be a bit smaller. This tool is best for carving, letter cutting, inlay and other small works for woodworking and other light materials. Small but durable. Its body is made from high-density PVC board. Likewise, the CNC program is fun and easy to complete – around 3-4 hours. 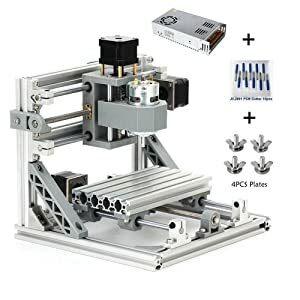 A great CNC tool to start with for an affordable price. However, it doesn’t come with a spindle or tool holders, so you need to buy one.